Pixi just took over my daily skincare ritual when their cruelty-free Rose Collection with its cute pink and pastel green packaging landed on my shelf. I am a fan of products that contain roses in general and this collection is a winner. Who needs a bachelor, I have all the roses bottled! One thing ahead to not disappoint you: Even if the products are all called Rose, their scent is very subtle and your skin will not smell like a whole rose garden after using them. But they do a more than average job in what you wish from skincare: Make you look radiant and let your skin shine. The first step of skincare is always the cleansing and this cream with rose, avocado, and camomille is gentle and soothing, yet effective. It helps to strengthen and soften the skin and it's even suitable for very sensitive skin. 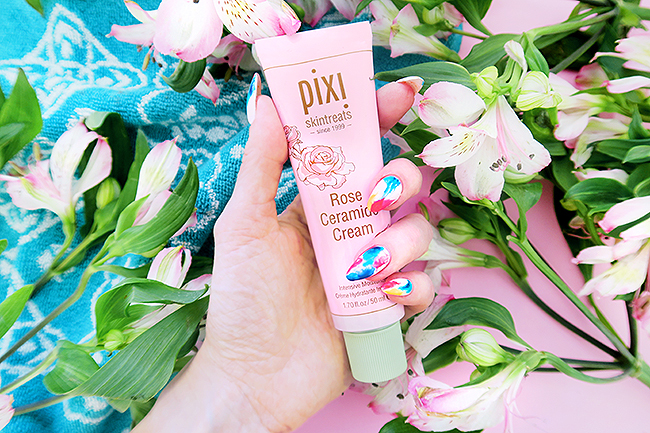 You'd think all cream cleansers would be moisturizing, but my experience taught me they often don't, unlike the Pixi Rose Cream Cleanser. I use it twice a day and it has become my new fav cleanser since the fresh and clean feeling it gives me is amazing. Thumbs up! You can use the tonic right after cleaning your skin and it helps to balance the PH, minimize redness and calms the skin. 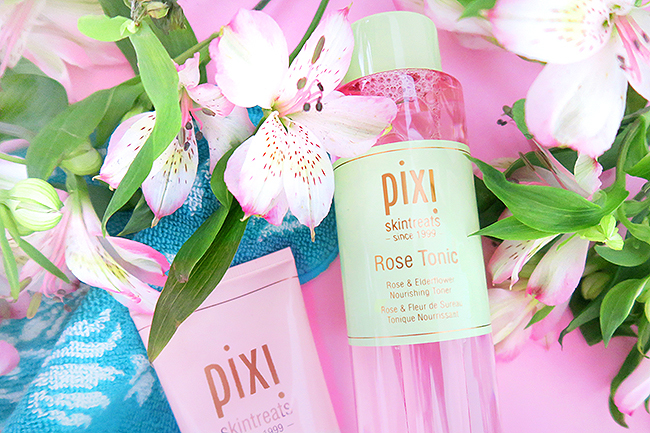 I think the Glow Tonic – probably Pixi's most famous product – might be better for younger skin that needs exfoliating, while the Rose Tonic is more soothing. It also helps the skin to absorb more moisture which is great when you continue your skin care ritual with the Rose Ceramide Cream. I am already a big fan of the Rose Tonic since it's just what I need for my skin that tends to get red. This very rich cream is infused with ceramides and rose oil and works for normal to dry skin. It deeply hydrates and nourishes and has a very smooth texture. Its antioxidant-rich botanicals help to improve the elasticity of the skin and protect it against environmental aggressors. Without exaggerating, this is the best cream that I tried in a while and even if my skin is completely dry the Rose Ceramide Cream makes it soft and look smooth all day in a second. Despite being very rich it doesn't cake under my makeup and my rather sensitive skin seems to be more balanced since I use it. Will definitely repurchase this! A luxe, youth-boosting oil that enhances the elasticity of the skin and leaves it luminous. You can either apply two or three drops on its own or mix it with the Rose Ceramide cream. The mix of sweet almond, rosehip, jojoba, pomegranate, and rose geranium is a wonderful treatment that feeds your cells. As a wannabe beauty guru, I am a sucker for face oils and swear on their ability to make my skin look radiant. 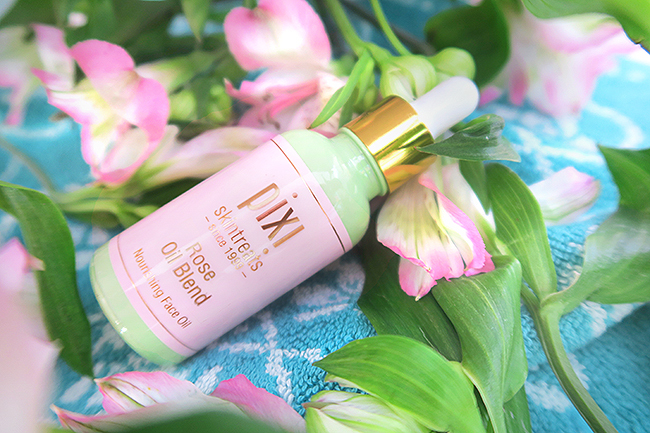 The Pixi Rose Oil Blend is one of my favourites yet and I intend to stick to it since it's far better value for the price than the other oils that I like. So a full win for Pixi, four products, maximal points!